Like many SUVs on the market, the Chevy Traverse provides many options for mounting a GPS, phone or tablet. The Chevy Traverse has a large interior and while there are a few locations that will not work, most places will work out just fine. Good job Chevy. 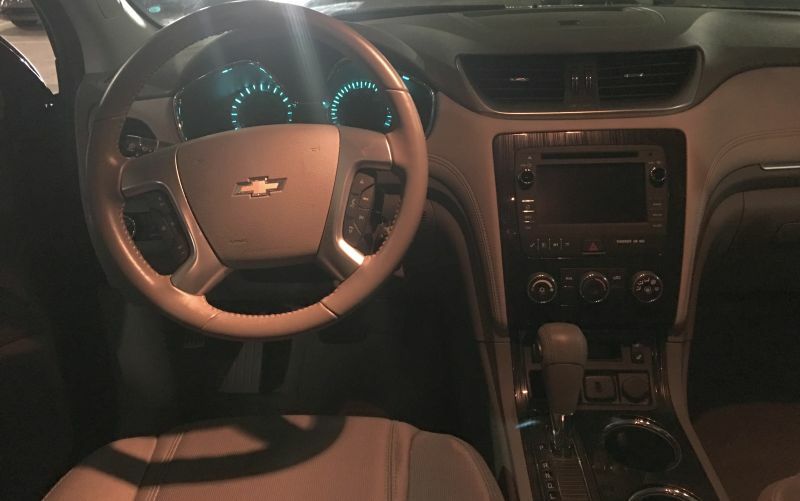 A photo of the interior of a Chevy Traverse accompanies this article. The dash s large enough to access practically all popular locations that we typically recommend. A vent mount is probably the best for a phone or GPS. The center vents in the Chevy Traverse are likely the best location. The Square Jellyfish Jelly-Grip Car Air Vent Mount is one that we have been recommending of late. The Square Jellyfish Jelly-Grip mount can be used to hold most phone models with or without a case or skin. It has a ball and socket so the cradle swivels into any orientation. This mount will work on flat vent slats that are 3/8 to 1 inch deep. The included cradle opens to 3 5/8 inches which is fairly large. The Square Jellyfish Jelly-Grip can also be used for a Garmin GPS. Remove the cradle to expose a 17mm ball. That ball size fits the back of any Garmin GPS cradle that’s made for use in a car. The windshield is a good choice for your phone. My go-to mount for this location is the Arkon MegaGrip Suction Cup Windshield and Dash Mount. The suction mount features a vacuum locked suction assembly attached to a pivoting arm. The phone can swivel into any orientation. The mount also includes an adhesive disk that you can stick to the dash. This turns the suction mount into a dash mount. The suction assembly can adhere to the adhesive disk just like it would on a windshield. I use this mount all the time and it works great. The same mount but for a Garmin GPS is the Arkon Windshield Dash Garmin Nuvi Suction Mount. I have recommended this one over the many years it has been available and have used it myself. A great mount that comes with a 2-year warranty. It’s more rugged and longer than the Garmin mount you received in the box. I couldn’t get access to the seat bolts on the Chevy Traverse. I won’t bother to go any further with these. A CD player mount will work ok on a Chevy Traverse however it will block the view of the touch screen. If that’s not an issue, consider the Mpow CD Slot Mount for SmartPhones. Be sure to follow the included instructions for a secure fit. The included cradle opens to 3.4 inches and swivels into any orientation. There are two cup holders in the middle console of a Chevy Traverse. The gear shift is inconveniently placed right next to those cup holders. Be sure the cup holder mount has an extension so the device doesn’t get in the way of the gear shift. Also, be sure you don’t need for a GPS app as it is inconveniently placed for this purpose on a Chevy Traverse. The Arkon Car Cup Holder Mount for Tablets is a nice choice for almost any tablet and fits large tablets all the way up to an Apple iPad Pro. This cup holder mount features an adjustable stem to allow angling and it swivels into any orientation. In summary, most typical mount placements should work well on a Chevy Traverse with the exception of the seat bolt mount. I like the vent and windshield the best for all devices except a tablet. For a tablet, the cup holders are likely the best location.